Is this the harshest sacking in football this season? 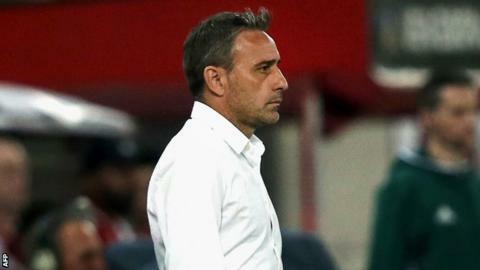 Greek side Olympiakos have dismissed former Portugal coach Paulo Bento, despite leading the Superleague by seven points. Bento's sacking after seven months in the job, came after Olympiakos' third straight league defeat on Sunday opened the door for second-placed Panionios, who have a game in hand. The 47-year-old was Olympiakos' second manager this season. Victor Sanchez was sacked in August after two games and less than two months in charge, following the club's exit from the Champions League in the third qualifying round. Bento, who led his country at the 2014 World Cup, lost four out of 23 league matches. But winning the league is what is expected at Olympiakos - they have been champions in all but two seasons since 2000. Bento leaves a team still in the hunt for three trophies. They have a last-16 tie against Turkish side Besiktas in the Europa League and are also in the Greek Cup semi-finals.